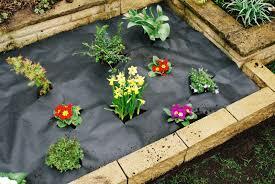 Clients often ask me to lay a fabric membrane to “suppress weeds”. This is usually as part of a plan to minimise maintenance, or specifically weed growth. But what the client expects, and what they get, may be very different, even though I might provide exactly what they request. The concept that a membrane can be used to suppress weeds for long is not real. It’s the weed suppressing membrane myth. Let me qualify that further. If you want to be able to plant in or around it, and have your plants survive or thrive, it does not work. In fact a fabric or membrane can often makes things worse. If you want to lay a path or hard standing of aggregate that will not contain plants then it may work for a while. If fabric is laid to cover the area between plants, be it mulched or not, the area will eventually become fertile above the membrane. As material decomposes and provides a base for seeds to germinate, the ground below deteriorates as it becomes starved of nutrients. And as a layer of compost like material forms on top of the fabric, the first things to germinate will be those with tough roots – like ash and dandelion – that penetrate and anchor it. Now try digging them out. And those covered with aggregate that looked so smart for a while. Now there is detritus gathering between the stones, enough for seeds to germinate. And once they penetrate the fabric… it’s a familiar tale. Meanwhile the soil below is unable to benefit from the nutrients laying above. Worms working the soil cannot reach the materials to drag it into the soil. It will gradually become lifeless. Weed suppression is for me in the same category as the no or low maintenance garden. It is feasible, but subject to many caveats and just as much work to make it effective. Low maintenance is possible, in particular growing conditions or by compromising on the plants you might want, choosing instead from a more limited palette. So what does work to suppress weeds then? Several things are better than the weed suppressing membrane myth. Less stress about weeds helps, just accept that they will grow. Even if you eliminate every one in your garden, the seed will blow in from next door. Or a therapeutic hoeing regime, leaving the cut weeds to cook in the sun. Mulch works– plenty of it will suppress weeds. Until it starts to break down, at which point it nourishes the soil. So renew it at least twice a year. Best of all is a dense planting plan that prevents weed seeds getting to the soil to grow. Include plants who’s presence will kill off the seedlings of anything else around it. This is called allelopathy, and is a fascinating subject for those with time to consider the potential.